March 2, 2012 - Tuesday evening, a U.S Coast Guard MH-65C Dolphin helicopter, from Aviation Training Center (ATC) Mobile, Alabama crashed in Mobile Bay (CG-6535). The MH-65C was flown by a four-person crew and was conducting training operations. A full Coast Guard and interagency search and rescue effort was launched and the aircraft was quickly located near Point Clear. One deceased crewmember was recovered, and extensive efforts continue to locate the other three crewmembers. Deceased is Chief Petty Officer Fernando Jorge. Missing are Petty Officer 3rd Class Andrew Knight, Lt. j.g. Thomas Cameron and Lt. Cmdr. Dale Taylor. The search has been ongoing since Tuesday when communications with the crew of the MH-65C were lost during a training flight over Mobile Bay. Rescue crews who arrived on scene immediately recovered a crewmember that was found unresponsive and later declared deceased. By Wednesday, a salvage ship was dispatched and divers began searched the muddy bottom of Alabama's Mobile Bay, but were unable to gain access to its fuselage in 13 feet of water. Overnight, a crew aboard the Ben R. Johnson, a 57-foot salvage vessel, recovered the helicopter fuselage from the bottom of Mobile Bay. The fuselage did not contain the bodies of the three missing crewmembers. By Thursday, Coast Guard aircraft, boats and cutters along with state and local resources and Good Samaritan vessels were participating in the search effort. 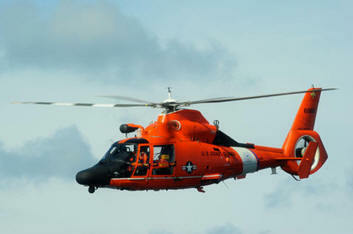 The Coast Guard recovered two crewmembers, the remains of Lt. Cmdr. Dale Taylor, of Snow Hill, N.C., and Lt. j.g. Thomas Cameron, of Portland, Ore., were recovered by response personnel. Missing is Petty Officer 3rd Class Andrew Knight of Thomasville, Ala. The Coast Guard suspended the active search and rescue operations Thursday night and are now conducting salvage and recovery operations. "We saturated 95 percent of Mobile Bay for nearly two days with both aircraft and boats to thoroughly cover the search area. 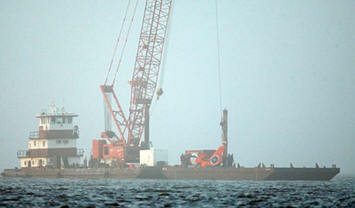 The decision to suspend the active search was terribly difficult," said Capt. Donald J. Rose, commander of Coast Guard Sector Mobile. "Now, we must shift our focus to continuing salvage and recovery operations. As we continue to recover wreckage, we will look for the missing crewman." Coast Guard crews searched for 36 hours, conducting approximately 30 search patterns with track-line-search legs that covered 1,198 nautical miles within a search area of more than 200 square-nautical miles in an effort to locate the Coast Guardsmen. Crews and aircraft from multiple Coast Guard units, as well as several state and local first responder agencies, such as Alabama Marine Resources, Mobile Sheriff's Department, Bon Secour Fire Department and Daphne Search and Rescue participated in the search efforts. The tail section of the helicopter and other components were recovered Thursday by the crew aboard the Ben R. Johnson, a 57-foot salvage vessel. Wednesday night, the Ben R. Johnson recovered the helicopter fuselage from the bottom of Mobile Bay.